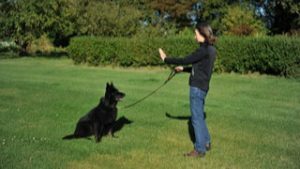 Getting a dog to focus on the handler can be demanding, especially if she is reluctant to give much eye contact. 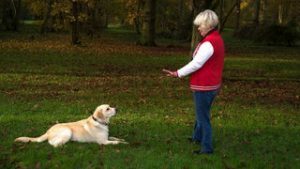 Using verbal commands is the usual way to train a dog, but introducing a hand signal to show the dog what we want is a useful technique to which most dogs respond quite readily. It’s probably the easiest system and most effective way to teach the basic positions, e.g. sit, down, stay, stand. Use a treat or favourite toy for the dog to focus on and encourage the dog to move into the required position then reward her. When training the “sit”, raise the treat or toy above and slightly behind the dog’s head, keeping your hand a few inches above from the skull. 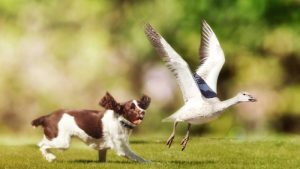 This action will encourage the dog to look up, which means that her tail end has to move into the “sit” position to allow her a better view of the treat or toy. There is no need to say anything initially, but after a few successful tries, introduce the command “sit” to match the word to the position. Soon you will find that your dog sits without needing a treat or toy to encourage her. Dogs are visual creatures and our language is just a collection of sounds. Keep practicing and you will soon find that your dog looks at you more often, waiting for your next instruction. 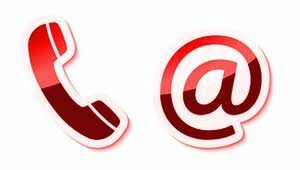 Keep training sessions short and make training fun! 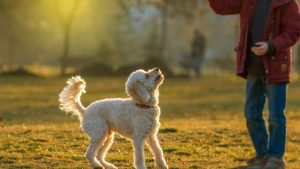 Why Does My Dog: Spin around when greeting me? Why Does My Dog: Seem reluctant to go out walking on lead?